The DJI Inspire Travel Mode is designed to allow the DJI Inspire to fold down flat and fit into it’s travel case during transit. It’s a nifty little feature and feels pretty cool the first couple of times that you do it. Every now and again it seems to have a glitch. Have you ever tried to get the Inspire to go into travel mode, only for it to keep lifting it’s legs until it has it’s belly on the floor and it falls onto it’s side? It will then lower its legs again back to flight mode and you will need to start over. This is particularly annoying when you are in front of a client looking silly or are just plain tired at the end of a shoot. All you want to do is put the Inspire away in it’s case. The thing won’t go into travel mode, no matter how nicely you ask. Heres a quick tip to solve your problem. The problem I am describing here is caused by the surface that you have placed the Inspire onto. 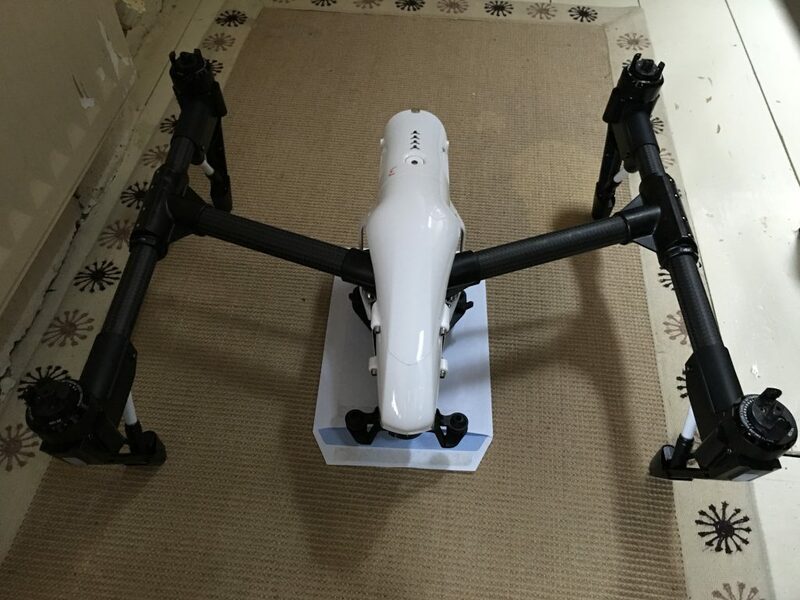 It uses the sensor on the bottom of the drone to know when to stop lowering itself and this sensor is easily confused by uneven surfaces such as grass or the rug shown in the picture below. You have two options, either put it onto a different surface or slide something under the sensor. In the picture I have used an envelope, in the field I often use my iPad cover as it does the job and is always to hand.